I have a pretty big confession to make: I've never made a roast chicken that I liked. I feel like there's always something off about it. Either the skin is too browned... or it's not crispy enough... or the breast is overcooked, while the legs are undercooked... or it's too salty... or it's too bland. That is, until I made this flat-roasted chicken. This chicken is perfection. I've never really understood it when famous chefs say that a roasted chicken would be their "last meal." I mean, come on, that's so boring! Pick something better! But after eating this chicken, I can totally see it. The skin was gloriously crispy and salty. And the meat itself was perfectly cooked, juicy, and well, perfect. From the first bite to the last bite, I couldn't stop gushing about this meal. Buy a smaller bird. 3-3 1/2 pounds is perfect. You'll also want it to be as "clean" as possible. Meaning, go for the pastured, organic chicken. With something as simple as this, it's important to use the best quality ingredients. Don't be shy with the salt and pepper. It won't be too salty. When I say be generous, be generous. Spatchcock this bad boy. If you're unfamiliar, this means to cut out the backbone, which is what allows you to flat-roast it. I'll admit, the idea made me pretty squeamish, but just watch this you-tube video, and go for it. It took less than 5 minutes. Spatchcocking not only allows you to cook an entire chicken in less than 45 minutes, but it's the key to that super-crispy and perfectly browned skin. Tiny potatoes. They are usually sold in cute little mesh bags in the grocery store. These were multicolored, and Caroline really got a kick out of eating purple potatoes. As the fat renders off the chicken, it melts into these potatoes, and they are sinfully rich, buttery, and totally delicious. Don't skip these! A sprinkling of fresh thyme and a squeeze of lemon juice to finish it off. This give you just the right amount of freshness and acid to balance the salty richness of the chicken and potatoes. Sometimes it's easy to be seduced by 45-ingredient recipes that seem like such fun combinations and flavors, but keeping things simple really allows ingredients to shine. This made a perfect Sunday dinner with some roasted broccoli and carrots, a green salad, and some rolls. This chicken took me from a roasted chicken-skeptic to a major believer. This is definitely last meal-worthy. Preheat the oven to 450 degrees. Cut the backbone out of the chicken using a pair of sharp kitchen shears, then flatten the breast by cutting through the cartilage (watch the video I linked above for a detailed tutorial!). Generously season the cavity with salt and pepper, then transfer the chicken to a roasting pan or 12-inch cast iron skillet (recommended), laying the chicken breast side-up. Gently pat the skin dry with a paper towel, then generously season the skin with more salt and pepper. Toss the potatoes with the melted butter or olive oil, salt, and pepper, then arrange them around the chicken in the skillet. Roast the chicken 30 to 45 minutes, or until a thermometer inserted into the the thigh reads 165 degrees Fahrenheit. Stir the potatoes after about 20 minutes, so they cook evenly. Remove the skillet from the oven, and sprinkle with the thyme and drizzle with the lemon juice. Allow the chicken to rest at room temperature 10-15 minutes before carving and serving. Ah of course. Leave it to SK to come up with the perfect roasted chicken recipe! Oh Josie, this looks incredible! I have got to make this. I just love the way the house smells when there's a chicken roasting in the oven. 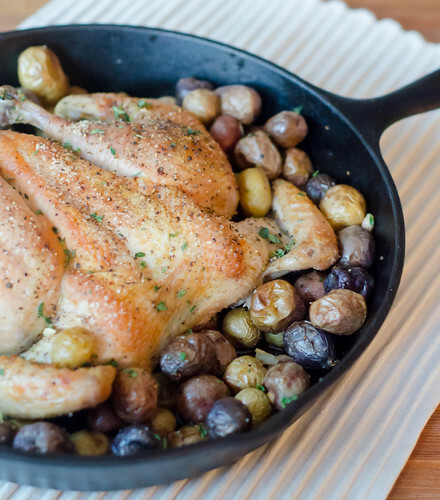 i love eating Flat-Roasted Chicken with Tiny Potatoes...it so delicious. I just made this tonight for dinner and it was so, so delicious!! Even my picky 3 year old loved it. Winner!! Yay, so glad to hear it! It's definitely one of our favorites as well! roaster chicken, this looks delicious! can't wait to try this recipe of yours.